The Greeks began their general attack on the 22 nd June, 1920, along the Milne line*). Their troops were six divisions strong. They attacked with three divisions in two columns in the direction Ak Hissar Soma; with two divisions in the direction of Salihli and with one in front of Aidin. The enemy s northern columns advanced on the 30 th June to Balikesri and the enemy s cavalry occupied Kirmasti and Karadja Bey on the 2 nd July, 1920. Destroying the bridge of Ulu Abad, our 6i st and 56 th – Divisions that were facing them retired in the direction of Brusa. The enemy continued to advance, occupied Brusa and pushed his vanguard forward to the line Dimbos Aksu. Our troops had been seriously shaken, and they retired as far as Eski-Shehr. While these operations were going on, the English landed troops at Mudania on the 25 th June and some others at Panderma on the 2 nd July. *) This is the line of demarcation fixed by General Milne, commanding the Allied troops, as arranged at the Peace Conference in Paris and which had to be respected by both the Turks and the Greeks. This line ran from the coast north-east of Aivalik to the north of Soma, to the east of Manissa, to the west of Salihli, to the east of Odemish, to the east and south of Aidin, reaching the coast again north of Skalalowa. further advance, they occupied Ushak and penetrated as far as the district of Dumlu Punar, the heights of which, however, were held by us. The national forces and the 23 rd Division facing the enemy suffered heavy casualties which apparently weakened them very much. A Greek column, marching from Aidin, advanced as far as Nasilli. You are probably aware that at the time of these operations our troops were mere skeletons without ammunition and incapable of being reinforced. I went personally to Eski-Shehr and from there into the front line. I ordered our forces which were in this district and elsewhere to be reorganised. I took every care that new fronts under a regular com mand were established against the enemy. The Greek offensive and the break up of our defences caused by it produced a great crisis in the Assembly, which found its expression in violent attacks and severe criticism. In the forty-first sitting of the Grand National Assembly on the 13 th July some questions were addressed to the General Staff and to the Ministry of the Interior demanding why Bekir Sami Bey, com manding at Brusa, Hadjim Muhiddin Bey, Governor of the same Vilayet, and Ashir Bey, commanding at Alah-Shehr, had not been court-marshalled for their failure and their errors in the field. It was necessary for me to intervene in these protracted and heated debates. Appreciating the feelings of the Assembly in the difficult position that had been created and the interest they took in it, I gave information and explanations with the object of calming the minds of the deputies and allaying these unhappy sentiments. After replying to some minor attacks produced by my statements, I declared that those I had akeady given were quite sufficient. Before these lively discussions had taken place, the particulars of which you will have read in the proceedings of the Assembly, similar debates had taken place on the 26 th July during the secret sitting. I had then also been compelled to give long explanations. In face of the criticisms and the motions that had been made and which were based on the general misfortune, everybody seemed to have forgotten the real causes and factors of the defeat. Attempts were made to put the responsibility for every reverse on the Council of Ministers that had been formed scarcely two months previously and that had taken over the responsibility of the Government, Nobody thought of the fact that the Greek Army had established itself and had continued to make preparations in the Smyrna district for more than a year past and that, in opposition to this fact, the Stambul Governments had done everything possible to render our army defenceless and had done nothing else but tried to break up and destroy the forces which the nation had been able to collect. They were not possessed of a sufficient sense of justice to recognise that it was only due to the energy and efforts of about five or ten determined and devoted men that in the course of a year we had, more or less, suc ceeded in creating a situation which the enemy had to reckon with. Nobody seemed to have judged or discussed the operations from the point of view of the military exigencies or with any knowledge of the actual state of affairs. The speeches that were delivered developed into shouts and complaints, either from overstrained patriotism or from moral weakness. Among those who spoke were men although they were few whose faith in the nation and whose patriotism were doubtful. To avoid any possible misfortune we must first think of pre ventive means to meet it. When the misfortune has happened it is no good to complain. Before it began the Greek offensive was re garded as very probable. If the necessary precautions and measures had not been taken to meet it, the responsibility must not be put on the Grand National Assembly of Turkey and their Government. 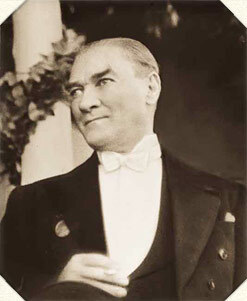 The Governments of Stambul, together with the whole of the nation, ought to have begun seriously at least a year before to take the steps which the Grand National Assembly had on their part undertaken as soon as they had assumed the responsibility of the Government. Calling up troops at the front to suppress the internal unrest was con sidered to be of greater importance and urgency than arraying them against the Greeks, advisable as that might have been. Even to-day this is still the case. Possibly the enemy s attack could not have been pushed forward so far if the following troops had been at our disposition at the front: Those detachments that we had to take from Brusa; the two columns which had been sent into the disturbed district of Ada Basar ; the column that had been scattered at Hendek these four bodies of troops and the other that was fighting against the insurgents in the districts of Sile and Yeni Han and those national troops which were supporting all these regular forces. Not until rest is secured in the country and the unity and firmness of the nation and their desire for liberation is established will it be possible to work with the object of opposing a foreign enemy, and even from such an effort no essential advantage can be expected. But if the nation and the country observed an attitude such as I recommend, a success which the enemy might gain at any time and which might lead to the occupation of a large territory, could only be of a temporary character. A nation that asserts and maintains its unity and its will, sooner or later will be able to bring any proud enemy who attacks it to suffer for his presumption. For this reason, it is surely more im portant to suppress the upheavals in the country than to fight against the Greek offensive. Besides, it was scarcely to be expected that the Greek offensive could have been otherwise, even if those troops which were appointed to oppose it would not have been withdrawn from the front on account of the trouble in the country. For instance, on the Northern front the enemy attacked with three divisions; we had no troops there that were of proportionate strength. It is not reason able to make a great fuss and to say that the catastrophe would not have happened if our troops had taken up a position on this or that river or in this or that village, or if the officers commanding them would have stopped the enemy in his advance. There is no instance in history to show that a front has not been or could not be broken through. And this is specially the case if the front in question is not limited in proportion to the troops defending it but extending over hundreds of kilometres, for it would be a false conclusion to expect that weak troops at one or other point in the line could defend it indefinitely. Fronts can be broken through, but it is necessary to fill up the gaps in the line as soon as possible. This is only possible if reserves drawn up in echelon can be held in rear of the forces in the front line. But were our national forces facing the Greek Army in such a position and had they such reserves behind them? Was even the smallest unit worthy of the name of a fighting force still left in our West-Anatolian provinces, including the town and district of Angora or, more precisely, in the whole of our country? It is illogical to expect results from the defence which the popu lation of the villages in the neighbourhood of the fighting zone could offer. Even if we possessed the power and the means to bring all the auxiliary forces of the country into operation, time would have been required for the establishment of a serious military organisation and thereby have made certain of success. Was not the flower of our Army under the command of Bekir Sami Bey at Brusa composed of the skeletons of the two regiments that had been surrendered to the Greeks before they had fired a shot and which had been transported to Mudania on Greek ships ? Had the Government in Stambul done anything to change the moral standard of those troops? Was not the Government of Stambul who had our troops that were attempting to defend Balikesri against attacks by the Greeks responsible for being attacked in the rear by Ansawur? It must not be forgotten that the Governments of Stambul and the Caliph-Sultan employed the Army of the Caliphate and the troops of the rebels on the road between Hendek-Duzje for the purpose of poisoning the spirit of our troops, as they had done to the 24 tb – Division which later on they had dispersed and killed their officers at the time this comparatively strong division was destined for the Greek front. Was it possible that the Council of Ministers who had only just taken the destiny of the country ixtfo their hands could think of a mobilisation under the conditions that prevailed at that time? Was it possible or practicable to call the nation under arms at a moment when the country, from one end to the other, was driven and compelled to carry out the stipu lations of the Caliph s Fetwa? On the other hand, was it not indis pensable before calling the whole nation under arms to think of the necessary quantity of arms, money, ammunition and transport to maintain them? In examining the situation and calculating the measures to be undertaken, facts, bitter as they might be, must never be lost sight of. There is no necessity or compulsion to deceive our- selves or one another. We were well aware of the requirements of the situation and the needs of the men at the front. I received a number of telegrams from all directions to this effect: “Send strong regular troops;” “Send such and such quantity of ammunition, because if we do not receive it we shall probably be defeated.” All these telegrams sent under the excitement of the moment represented the situation in similar sensational language. Our duty and the situation we were in urged us not to destroy the moral of those who appealed to us. We had to guard against allowing ourselves to be influenced by their excitement, but rather to act in a way that would inspire them with hope and confidence. We trusted that the situation would soon improve and that means would be found which would be really adapted to give the country and the nation hope and confidence. There was nothing to hinder this. The Executive Council could also call men of several different categories under arms.